It comes as no surprise to anyone that the profession of Photographer is not what it used to be and I have been feeling the pinch for a few years now. Instead of complaining about newbies undercutting the industry standard, or throwing in the towel, I have been maintaining my client base and pursuing a new goal of becoming MORE than your standard a photographer. This journey has put me on the path to higher education and a lot of conscious learning via the internet. It’s absolutely no surprise that the WWW. is full of sites that can educate/teach you on how to do anything from cutting your kids hair to replacing your cars radiator, and if you have enough time and talent to dedicate to learn a new skill, all the information you need is there and most of it for free. This has put a crunch on many professions who’s skill sets were once deemed irreplaceable, not just that of photographer. And, with the impending AI age that is set to take over many jobs in the next 15 years I am sure we’re all feeling a little unease of our own future and that of our children’s as well. With this new understanding of my learning style comes a true appreciation for “new technology” and an excitement for it’s place in our school system. Imagine how many children will benefit from seeing moving pictures as they learn history lessons, solve math problems with more visual examples, and have access to auditory lessons and questions. Less children will be left behind right! There’s a reality that our education system has a lot of room for growth but too much bureaucracy for that growth be auspicious. There is also this interesting gap that is growing right now, where our children can learn skills (via the internet) that far surpass their own teachers knowledge. Where the student becomes the master. What and how our children are learning is changing organically leaving many teachers to push their own education and skills to keep up with their younger Minecraft aficionados. My son’s school recently saw success and were even featured on the Rick Mercer show during this years Cardboard Boat Competition. His school has a S.T.E.A.M. (science, technology, engineering, arts & math) program with a teacher, who is embracing technology with open arms so that he can, in turn, inspire the young minds around him. The idea that robots will be teaching our kids is one that we should really take seriously. It’s happening all over the world right now and it won’t be long before Mrs. Grey becomes MR5GR3Y. I believe it’s up to our generation to set the bar, and ensure that the value of human contact and interaction is placed at the fore front of our daily lives. To set the example that we can do anything we put our minds and hearts to, but also set the balance between technology and family time. It’s really an exciting time we’re living in and I have a goal to stay on top of it the best I can. My skill set doesn’t have to reflect my age, thanks to YouTube ;P, and neither does my boy’s. They are sponges who are excited for the world around them. They have the capacity to maneuver most games and devices with an ease that our geriatric generation struggles to realize, however, what’s being left behind is the ideals that we all have to work hard in real time if we are going to progress the world around us. 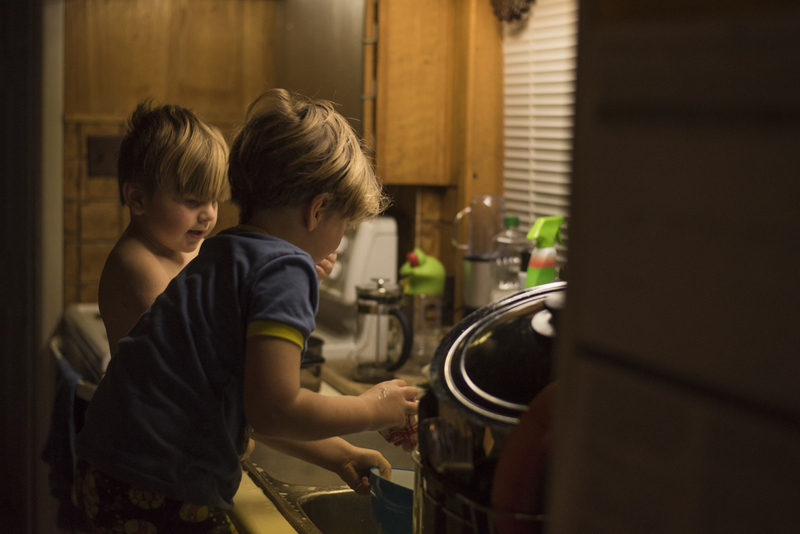 Give a kid a dish and they can eat a meal, teach a kid to do dishes and they build motor skills through a tactile experience, gain a sense of responsibility in real time. Who knows if the job of dish washer will exist in the future, but one thing is for sure, the person who’s going to come up with the idea to automate it to perfections is the one who used to be doing the job with their hands.